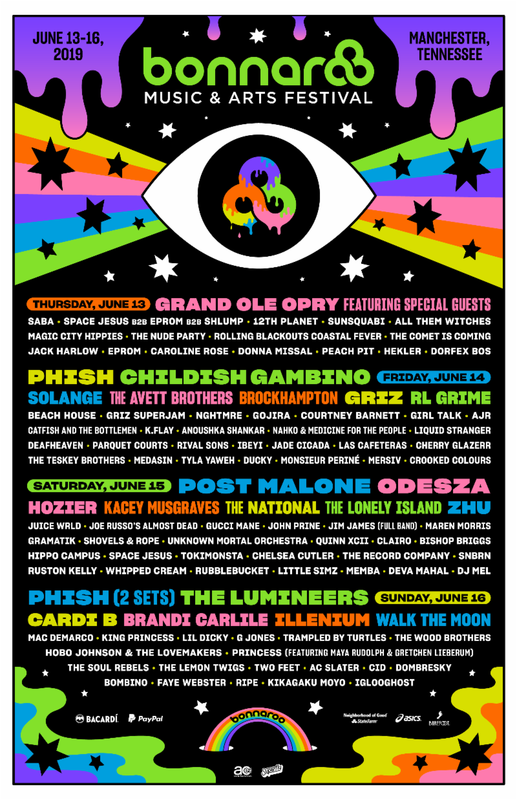 (MANCHESTER, TN) Superfly and A.C. Entertainment are excited to reveal the initial lineup for the 2019 Bonnaroo Music and Arts Festival. The 18th annual four-day multi-stage camping festival will take place June 13 – 16, held as always at Great Stage Park, the spectacular 700-acre farm and event space located just 60 miles southeast of Nashville in Manchester, TN. Tickets – including General Admission (4 Day), VIP (4 Day), Platinum (4 Day) and more – will go on sale Thursday, January 10, at 12 noon ET/11 am CT, exclusively viawww.bonnaroo.com/tickets. Bonnaroo has never been more accessible with GA ticket layaway plans available for just $47.